Qualcomm held an AI Day conference in San Francisco yesterday. During the event the chip designer announced new mid-range processors that will be coming to consumer devices from mid-2019 onwards. 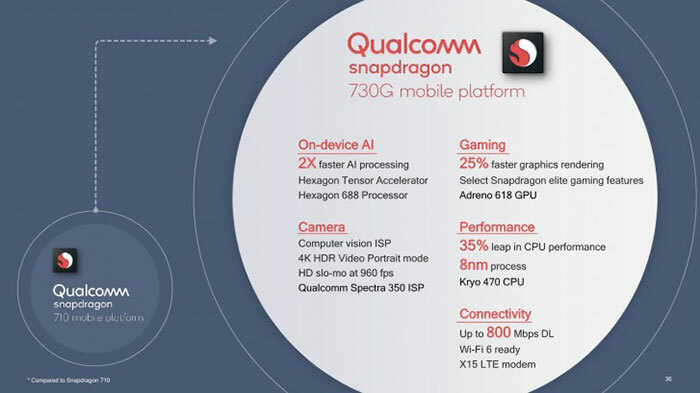 Only three new SoCs were announced for this target market but they could be significant for device makers and buyers as they include the first "elite gaming" tuned Snapdragon the Snapdragon 730G. 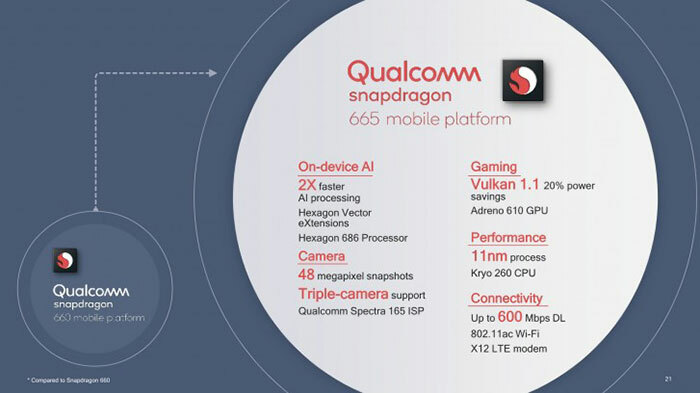 "With the introduction of the Snapdragon 730, 730G and 665 Mobile Platforms, we are bringing features such as sophisticated AI, exceptional gaming and advanced camera capabilities to a broad spectrum of devices at exceptional performance," said Qualcomm's Kedar Kondap, VP of product management. The SD730 and 730G will be fabricated by Samsung at 8nm LPP, and the new SD665 at 11nm LLP. These two chips are probably intended as replacements for the SD710. 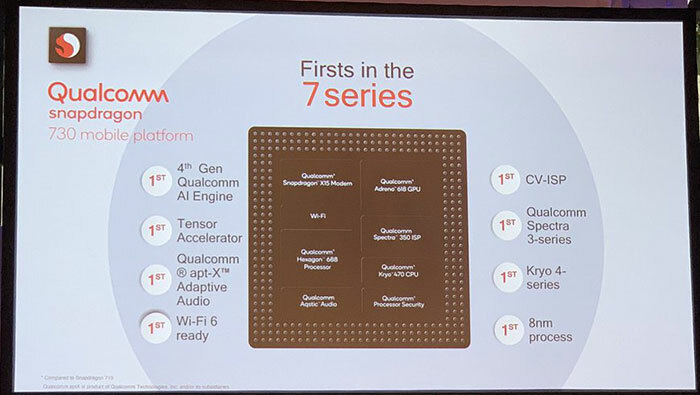 In the new processors Qualcomm has upgraded the two CPU 'big' cores from Kryo 360 (based on Arm Cortex-A75) to Kryo 470 (Cortex-A76), and max clock speeds remain the same at 2.2GHz. Meanwhile the six 'LITTLE' cores are still Arm Cortex-A55 based but get a 100MHz boost to 1.8GHz. Overall users should expect as much as a 35 per cent performance boost, according to Qualcomm's testing. The biggest difference between the SD730 and 730G is in the Adreno 618 GPU equipped. The Adreno 618 GPU supports Vulkan 1.1 and is 25 per cent faster than its predecessor. In the 'G' suffixed gaming SoC this GPU has been "enhanced" and will perform another 15 per cent faster, says Qualcomm. Other key components of the SD730 SoCs are the; Hexagon 688 DSP, Spectra 350 ISP, and Snapdragon X15 modem. The DSP is said to be twice as fast as its predecessor, and includes dedicated AI processing for the first time. Imaging is catered for by the ISP which enables fast and efficient computer vision, 4K HDR capture, depth sensing and support for up to triple cameras. Lastly the modem supports download speeds up to 800Mbps and is Wi-Fi 6-ready. It also seems like the SD730G comes with gaming optimised networking for lower latency and faster connected gaming experiences. This will be the successor to the popular SD660. It is made on a smaller 11nm process which should bring some efficiency and cost improvements. Its 4x Kryo 260 (Cortex-A73) cores are the same as in the SD660 but clocked 10 per cent slower at 2.0GHz. Meanwhile there is no change in the 'LITTLE' configuration of 4x Kryo 260 (Cortex-A53) cores at 1.8GHz. In the SD665 the GPU has been upgraded from a Adreno 512 to an Adreno 610 which should provide a generational jump and supports Vulkan 1.1. Meanwhile a Hexagon 686 DSP is present in this SoC, supporting on-device AI, and the Spectra 165 ISP supports up to a single 48MP or dual 16MP rear cameras, and even triple cam setups. Connectivity is provided by the Snapdragon X12 LTE Modem with LTE download speeds up to 600Mbps and integrated 802.11ac Wi-Fi. As mentioned in the intro, you should start seeing devices sporting these new processors from mid-year onwards.